I'm just wondering if the wireless adapter is the cause. Is this included with the new laptop or is it something you already had? Wireless on a laptop is a common thing now so I'm not sure why there would be a additional component needed. That's what I'm thinking too. But now I am confused as this appears to be a desktop. If that is the system then my question is really obvious. Is this a wireless adapter included with the new system or one you already had? Oh yeah, this isn't a laptop. It's a desktop. The link posted by Digerati is the system I bought. It didn't come with the computer. I bought it on my own. On my last computer, I made sure the video card drivers were up to date. I haven't updated the drivers on the new pc yet. I'm going to visit the HP site and just download all the drivers from there. Question... What is best to get for connecting to the internet wirelessly? USB adapter or PCI adapter? PCI right? I hear a lot of USB adapters have issues and that PCI is less problematic. I personally would go with the internal PCI adapter. As you stated I have also seen a lot of the USB type have issues. In fact my daughter's fiance has one and it won't connect to my router but if he uses the Ethernet connection from his Xbox360 it will connect with no problem. Same issue if he tries to use it on her computer. Could you recommend me a good quality PCI adapter? I'm looking for something that will connect with fast speed (300mbs) and has a strong signal. My router is located upstairs while the PC is downstairs. Sure i will try but this would be just my opinion and I'm sure others would have their favorites. First though I need to know is your router a G or N type? This will make a difference in what I suggest. Also please include your budget for your adapter. I would get an N type regardless. It will be backwards compatible and will be more future proof. I've used several of these with Linksys, D-Link, and Netgear "wireless routers" with no problems. I like the external antennas as that puts them outside the metal box called the case. I have a N type router. It is a Linksys Router if that helps as well. I am looking to spend about $50 or so on an adapter. N-type card seems to be the best route to go. HERE you go but I would forget the TP-Link one. Slower card from the specs. Thanks for the suggestions. I am going to give the Asus for $30 a try. Hope this will solve my problem. Please let us know when you have installed it and tested the signal strength and speed. Will do! Thanks again for your help. I just got the PCI card in the mail today. Hooked it up, Windows 7 found the drivers right away and installed them. Shall I receive any more BSOD (crossing my fingers I don't), I will post here again with the error. Hopefully that is not the case. Again thank you to both of you for your help. Edited by Xanster82, 25 August 2011 - 12:48 PM. 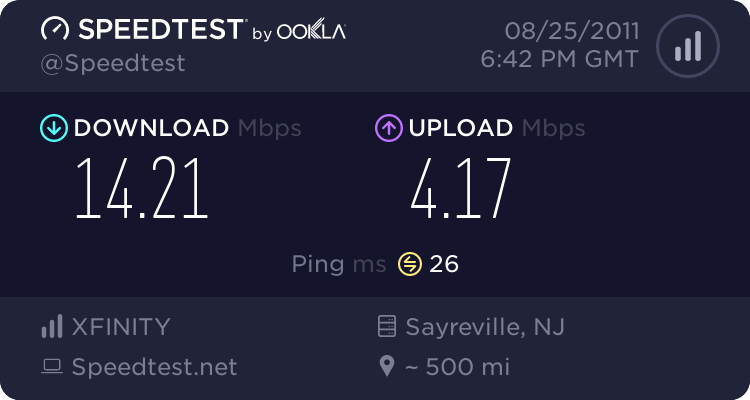 Much better speeds and I am glad it worked. Please let us know in a couple of days how everything is working.